I’ve been looking forward to the Catamount Trail Trapps to Bolton race for quite some time, pretty much since I crossed the finish line last year. It’s an awesome event; difficult race, unknown conditions and tons of variables, great prizes, free food, good cause, etc. The race starts with a couple of k’s on the groomed trails at Trapps before dropping down Old Country Rd into the Nebraska valley. 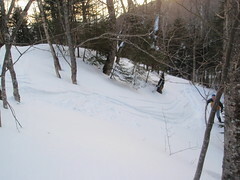 Then after two road sections where you need to take your skis off and run, you hit the main obstacle on the course, a long grinding climb up over the ridge, topping out at over 3000 feet. Once you’re over the climb, you have to navigate a technical decent down to the Bolton nordic center. In the weeks leading up to the event, I was doing a bunch of testing and going back and forth between two pairs of skis, one with a metal edge (for control), and one without (for climbing speed). With the nasty rain, tiny bit of snow, and cold that we got Friday into Saturday, I was back to square one with no idea what I’d use. Luckily, I had time on Saturday to go out and test both the climb (from the Nebraska valley), and the decent into Bolton. I realized that the decent was going to be nasty no matter what skis I had, but the climb was going to be next to impossible on fish scales alone. There just wasn’t enough new snow on top of the boilerplate ice, so the scales had nothing to grab onto. I made a last minute decision to borrow a pair of kicker skins and use the lighter skis without edges. As we lined up to start the race, I sized up the competition (Marc Gilbertson). He had similar skis, but no skins so I knew he would open a gap on me while I was putting on the skins, but I hoped I would be able to make it up on the long climb. Another wild card was Eric Carter from UVM. He was going to give it a go on waxless race classic skis. He’d definitely be fast on the groomed part, but I was pretty sure I’d see him suffering on the climb. Out of the start I settled into 3rd behind Eric and Marc. Eric was quickly out of site on his fast race skis, and Marc opened a gap on me pretty quickly too. Jake Hollenbach was cheering at the top of the groomed trails, and he said Eric was 1 minute ahead and Marc was about 15 seconds ahead. At the first road crossing, I struggled to get my skis off and by the time we got to the base of the climb after the second road crossing Marc was out of site. I put on my skins as fast as possible, but it still seemed to take forever and I almost got caught by the next racers. Once I started climbing I was making pretty good time, and sure enough I quickly caught up to Eric Carter. He must have had no kick at all because he was trying to run up the trail carrying his skis. A while later I passed Sam von Trapp who was doing the tour, and he said Marc was 4 minutes (!) ahead. I thought he was joking. I was sure I was making up ground, but 4 minutes was a lot. I thought it might be over, but I kept on and with only a few switch backs remaining before the top, I finally caught and passed Marc. I tried to get out of site as fast as possible, but I was starting to bonk so it wasn’t easy. Finally I got to the end of the ridge, ripped off the skins and headed down. The first few turns were tough due to the icy snow and my shaking legs, but after a few falls I got the hang of it and cruised the rest of the way down to the Nordic center to take the win. Just finishing this race is a real accomplishment. Congrats to all participants and thanks to Catamount Trail Org, Trapps and Bolton for making this a great event. Thanks Racers- we had a very successful 2008 Trapps to Bolton Backcountry race in some challenging conditions and weather last Saturday. Link here for full results! Catamount Trail BC Challenge Race — Trying to discourage all but the hardiest backcountry skiers, the race poster read ”No Wimps Allowed”. This didn’t discourage fourteen hardy souls who signed up to take the challenge and when it came to race day, twelve racers stepped up to the starting line. Socked in by dense fog and threatening rain, the racers sprinted out of the start on the groomed trails at the Trapp Family Touring Center. 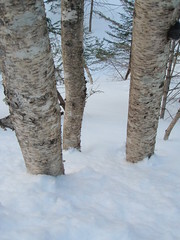 After three kilometers, they made a sharp turn onto the Old County Road and the ungroomed Catamount Trail. 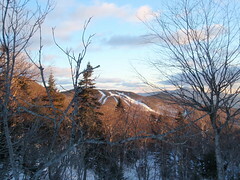 Another couple of kilometers, the racers were greeted by the Stowe Mountain and Rescue Squad at the beginning of a seven kilometer grueling climb to the highest point on the Catamount Trail at 2420 ft. At that point Eric Tremble led the charge at a blistering pace with Justin Beckwith in hot pursuit 30 seconds behind. The other competitors were more spread out as they paced themselves for the long climb ahead. 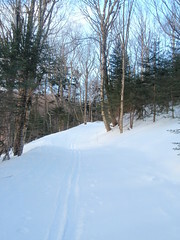 Racers using lighter weight racing poles with small baskets punched through the top layer of crusty snow causing more difficulty in the climb. About 45 minutes into the race the going got even tougher for the competitors as a cold rain created an icy coating on the course and harder climbing conditions for all those except racers with kicker skins. The finish arena was a welcome site for the competitors at the Bolton Valley Touring Center with professional race course fencing, pop up tents, and a enthusiastic group of spectators. First over the line was Eric Tremble of Jericho, VT who maintained his lead throughout the race and nailed down a lightning time of 1:42:39. Tremble crossed the finish line displaying a big smile and a trace of souvenir blood on his face caused by a crash in his daredevil descent. Justin Beckwith of Waitsfield, VT never backed off his pursuit of Tremble and crossed the finish line soon after in 1:44:40. Third place went to Chris Rodgers of Westford in 1:56:11. In the women’s category Sarah Moore from Waitsfield, VT overtook Betsy Richert of Keene, NY on the descent to take top honors in the women’s category in 2:23:48. Unable to detach her kicker skins, Richert lost valuable time in the downhill and finished 1 minute and fourteen seconds off the pace. Competitors used a wide range of equipment from no-wax touring skis and boots to heavy backcountry equipment and plastic boots. The winner, Eric Tremble used no-wax touring skis, light touring NNN boots, and BC telescoping poles. Beckwith raced with light metal edged BC skis outfitted with NNN racing bindings and a combi boot. His Swix Universal klister worked extremely well throughout the race but he said his race poles with smaller baskets hindered his climbing ability. Following the race, all competitors and volunteers were treated to a much appreciated pasta buffet at the BV Nordic Center. A great array of prizes were donated by by Karhu USA, Trapp Family Lodge, Rossignol, Bolton Valley, and the Catamount Trail Association. When the day came to an end, all the racers had a great time and vowed to return for the next years 2nd Annual BC Challenge. The profits from the race will be donated to the Catamount Trail Association. Link here for full results!